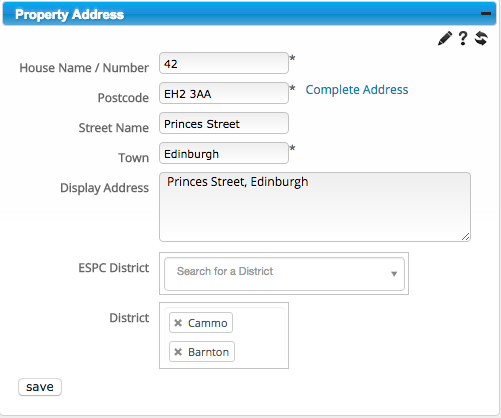 The Property Address widget contains the full address and postcode of the property as well as a field for Display Address. This is used in case you don’t wish to display the full address on your website or on 3rd party portals, so you can add a display address instead. Depending on the configuration of your account, you may also have input fields for ESPC district and District. ESPC district data is supplied by ESPC in Edinburgh and is only available to ESPC members. Typing the first letters of an ESPC district brings up a live match which allows you to select the district required. District is a custom-created list of districts that are relevant to your firm and can be used to classify property locations for use when using applicant property matching. NOTE: Zoopla requires the display address to be entered in three different parts, separated by commas. If this convention isn’t followed, they will display the full address instead. EG. 12, High Street, Brackley is a valid Zoopla display address. High Street, Brackley or 12 High Street, Brackley isn’t.